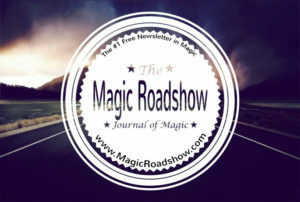 The MAGIC ROADSHOW is the largest FREE blog and newsletter in all of magic. We publish news stories, articles, and great effects from magicians around the world. About once a month we publish a new Magic Roadshow Journal of Magic.. and publish it right here. You can read it online… or download it as a PDF and read it at your convenience. Magic, Street Magic, Mentalism, Mental Magic, Close Up Magic and Mathmagic.. you’ll find it all in the Roadshow! Please sign up for the Roadshow Below, and be notified about once a month when a new issue posts. Absolutely NO spam!